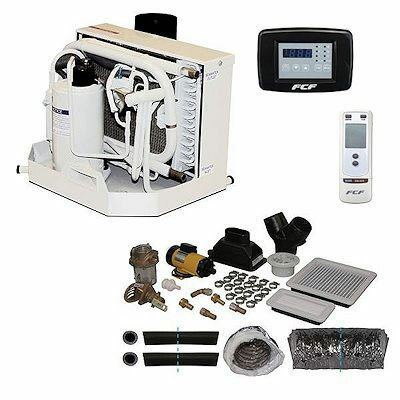 Includes AC System, Air Duct and Seawater Intake Kits, Inlet/Outlet 3/4"
The Webasto FCFK Air Conditioning with Reverse-Cycle Heat - Complete System Kit is exclusively designed for marine applications. The Webasto FCF Series Air Conditioner s are quiet, compact, economical, and efficient. The System Kit includes the components required for a complete FCF installation including: Air conditioning unit and controls, return and supply air duct kit, and seawater intake and discharge kit. Suggested Supply Air: 20 sq. in. Suggested Return Air: 100 sq. in.